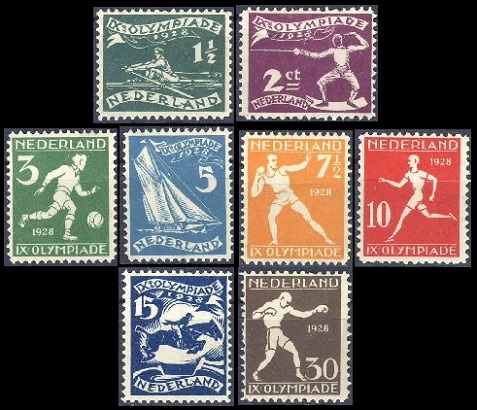 For surtaxed Netherlands stamps, the huge event of 1928 was the Summer Olympic Games, held in Amsterdam. A set of stamps was issued to publicize the World Olympics, with the surtax on the stamps helping to defray the cost of hosting the games. During the period from 1928 through 1932 surtaxed charity stamps were also issued for child welfare, the Rembrandt Society, and the promotion of tourism. 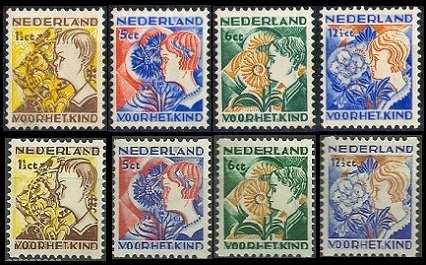 The eight surtaxed Netherlands stamps shown above (NVPH #212-19, Sc. #B25-32) were issued on March 27, 1928 to publicize the IX World Olympic Games, held in Amsterdam from July 28 through August 12, 1928. The surtax was intended to help defray the expenses of hosting the World Olympics. 01 1/2 C. + 01 C. - Rowing. 02 C. + 01 C. - Fencing. 03 C. + 01 C. - Soccer. 05 C. + 01 C. - Yachting. 07 1/2 C. + 02 1/2 C. - Shot Putting. 10 C. + 02 C. - Running. 15 C. + 02 C. - Riding. 30 C. + 03 C. - Boxing. 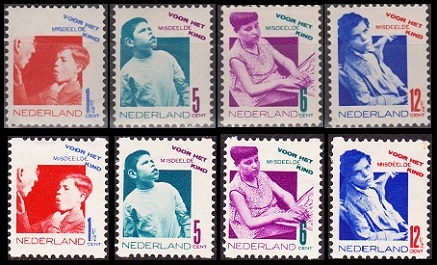 The annual child welfare Netherlands stamps shown above (NVPH #220-23, Sc. #B33-36) were issued on December 10, 1928. These stamps, benefiting children's charities, followed the theme of "science". The 1 1/2 C. + 1 C. denomination features Jan Pieter Minckelers (1748-1824), a physicist and the inventor of illuminated gas, used for hot air balloons. The 5 C. + 3 C. denomination features Hermann Boerhaave (1668-1738), a Dutch botanist and physician that attained European fame. The 7 1/2 C. + 2 1/2 C. denomination features Hendrik Lorentz (1853-1928), a Dutch physicist and the winner of the 1902 Nobel Prize in Physics. Albert Einstein later used his equations for his calculations of space and time. The 12 1/2 C. + 3 1/2 C. denomination features Christiaan Huygens (1629-1695), a Dutch mathematician, astronomer, and scientist. His works included the early studies of the rings of Saturn, the discovery of Saturn's moon Titan, and the invention of the pendulum clock. The surtaxed child welfare Netherlands stamps shown above (NVPH #225-228, #R82-85, Sc. #B37-40, #B37a-40a) were issued on December 10, 1929. In the manner of the definitive postage stamps of this time, these four stamps were issued both in sheet-format and in coil-format, with the coil stamps having syncopated perforations Type C. All of them are shown above. The designs of these stamps feature a child riding a dolphin. The three surtaxed Netherlands stamps shown above (NVPH #229-31, Sc. #B41-43) were issued on February 15, 1930, with the surtax benefiting the Rembrandt Society. 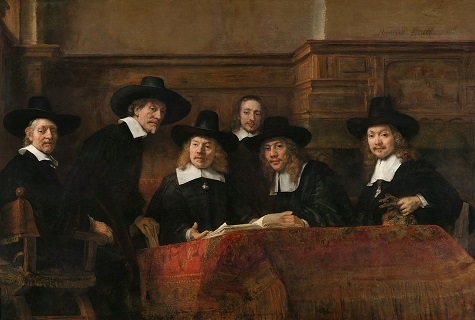 The Rembrandt Society or Rembrandt Association was founded in 1883. The society is a group of art patrons, focusing on art and art acquisitions in the Netherlands. Their threefold purpose is to assist museums in acquiring art, to ensure that important treasures remain accessible to the public, and to develop the stories about some of the important art treasures. The designs feature a self-portrait of Rembrandt, superimposed in front of his 1662 World famous painting, "The Drapers' Guild". 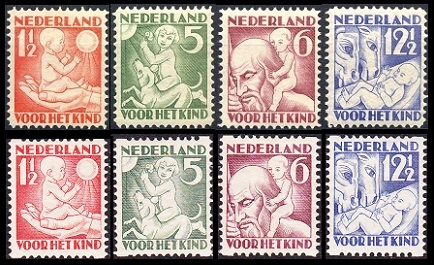 The surtaxed child welfare Netherlands stamps shown above (NVPH #232-35, #R86-89, Sc. #B44-47, #B44a-47a) were issued on December 10, 1930. In the manner of the definitive postage stamps of this time, these four stamps were issued both in sheet-format and in coil-format, with the coil stamps having syncopated perforations Type C. All of them are shown above. The designs of these stamps feature children in allegorical representations of Spring, Summer, Autumn, and Winter. The two surtaxed Netherlands stamps shown above (NVPH #238-39, Sc. #B48-49) were issued on October 1, 1931, with the surtax funding the restoration of gilt stained glass windows in St. John's Church in Gouda. The modernistic designs feature two phases of stained glass window restoration. 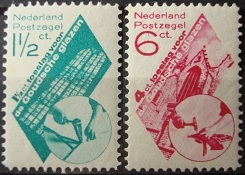 The surtaxed child welfare Netherlands stamps shown above (NVPH #240-43, #R94-97, Sc. #B50-53, #B50a-53a) were issued on December 10, 1931. In the manner of the definitive postage stamps of this time, these four stamps were issued both in sheet-format and in coil-format, with the coil stamps having syncopated perforations Type C. All of them are shown above. The designs of these stamps feature children with disabilities, as follows. 01 1/2 C. + 01 1/2 C. - Deaf mute learning lip reading. 05 C. + 03 C. - Mentally retarded child. 06 C. + 04 C. - Blind girl learning to read Braille. 12 1/2 C. + 03 1/2 C. - Victim of malnutrition. The four surtaxed stamps shown above (NVPH #244-47, Sc. #B54-57) were issued on May 23, 1932 to promote tourism and to benefit the National Tourist Association. 02 1/2 C. + 01 1/2 C. - Windmill and Dikes. 06 C. + 04 C. - Council House in Zierikzee. 07 1/2 C. + 03 1/2 C. - Drawbridge. 12 1/2 C. + 02 1/2 C. - Flower fields. 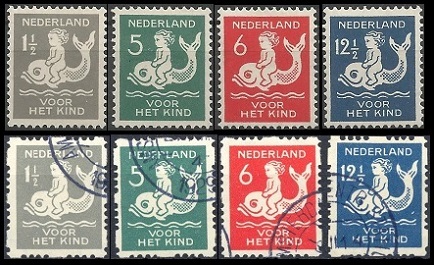 The surtaxed child welfare Netherlands stamps shown above (NVPH #248-51, #R94-97, Sc. #B58-61, #B58a-61a) were issued on December 10, 1932. In the manner of the definitive postage stamps of this time, these four stamps were issued both in sheet-format and in coil-format, with the coil stamps having syncopated perforations Type C. All of them are shown above. The designs of these stamps feature children and seasonal flowers, as follows. 01 1/2 C. + 01 1/2 C. - Boy and Furze. 05 C. + 03 C. - Girl and Cornflower. 06 C. + 04 C. - Boy and Sunflower. 12 1/2 C. + 03 1/2 C. - Girl and Christmas Rose. For the first time, the Olympic Flame was lit during the Opening Ceremony. The torch relay, however, would not occur until the 1936 Summer Olympic Games. For the first time, the Parade of Nations began with Greece and ended with the host country. These games were the first to feature a standard sixteen day schedule, which is still followed. Johnny Weissmuller of the USA, who would later appear as the character "Tarzan" in several movies, won two gold medals in swimming. India won its first gold medal ever in the sport of Field Hockey. Mikio Oda of Japan won the Triple Jump event, becoming the first athlete from an Asian country to ever win an Olympic gold medal. Crown Prince Olav, later the King of Norway, won a gold medal in sailing. Coca Cola made its first appearance as an Olympic sponsor. These games were the first to be called the "Summer Olympic Games". 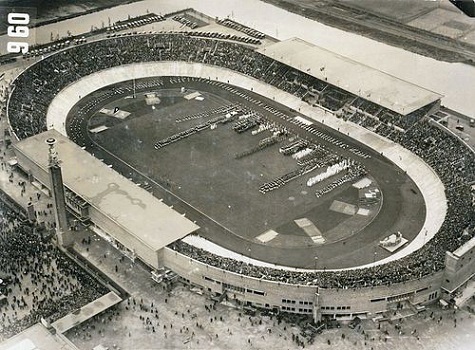 Germany returned to the Olympics for the first time since the 1912 Olympic Games in Stockholm. 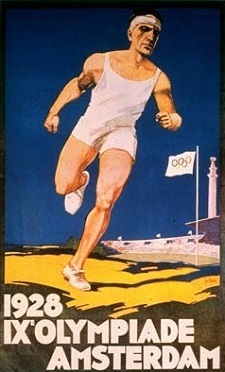 The 1928 German Olympic team finished second in the medal-count rankings.